This octagonal tower is over 34 meters high (111.5 ft.) It was built around 1300 A.D. as part of the city wall. 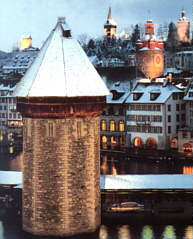 It is Luzern's trademark and the most photographed monument in Switzerland. It has been used in the past as an archive, treasury, prison and torture chamber.